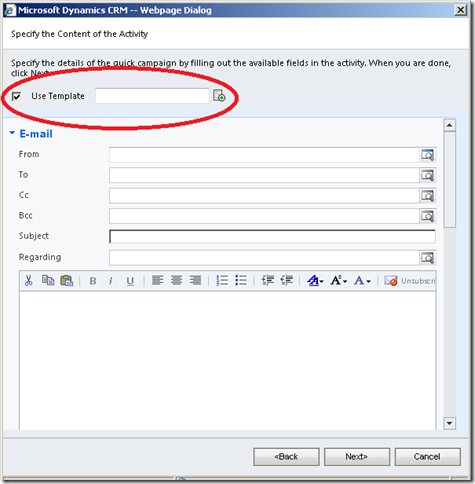 A frequent request from the customers of Microsoft Dynamics CRM 4.0 was the ability to add attachments to bulk email. Some users were also looking for a mechanism to use email templates when distributing Campaign Activities and Quick Campaign. 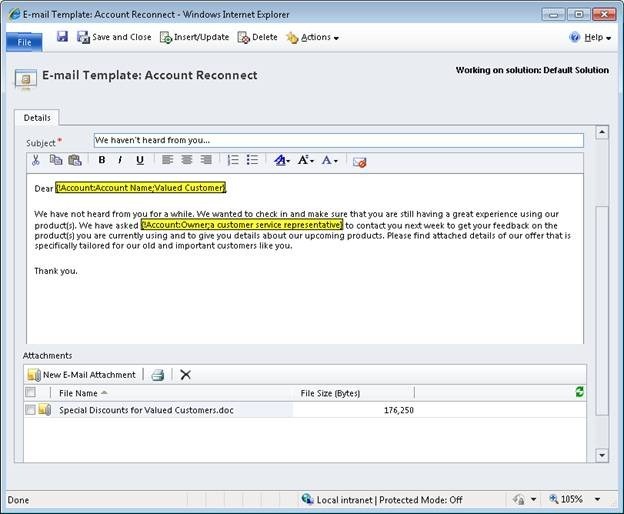 There were also requests to allow usage of attachments in email templates so that whenever some templates are used for sending emails, attachments are sent out as well. Microsoft Dynamics CRM 2011 addresses all these demands and provides a simple and efficient way to achieve them. Let’s take a look at how this could be done in Microsoft Dynamics CRM 2011. 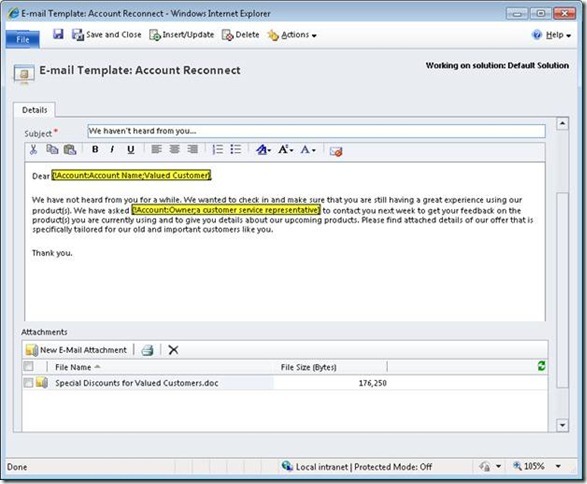 Adding attachments to email templates in Microsoft Dynamics CRM is as easy as adding attachment to any email. The email template form now comes with an attachment section embedded. On email templates form scroll down to find the attachments section and use this section to add and remove attachments effortlessly just as you would use it in emails. Once the attachments are added to the template, you can use this template while sending single email and the email would be sent with the attachment. When from a CRM grid, you select multiple customers and choose to send Bulk emails by pressing the ‘Send Direct E-mail’ button, you can use this template and the emails sent in bulk will have attachments in them. Microsoft Dynamics CRM 2011 now enables usage of Email Templates while running Quick Campaign or while distributing Campaign Activity. To select an Email template during Quick Campaign, navigate to the email form screen in the Quick Campaign wizard, select the ‘Use Template’ checkbox shown below and then lookup for the email template to use. If this email template has attachments added in it then the bulk email sent at the end of the Quick Campaign wizard will have attachments in them. 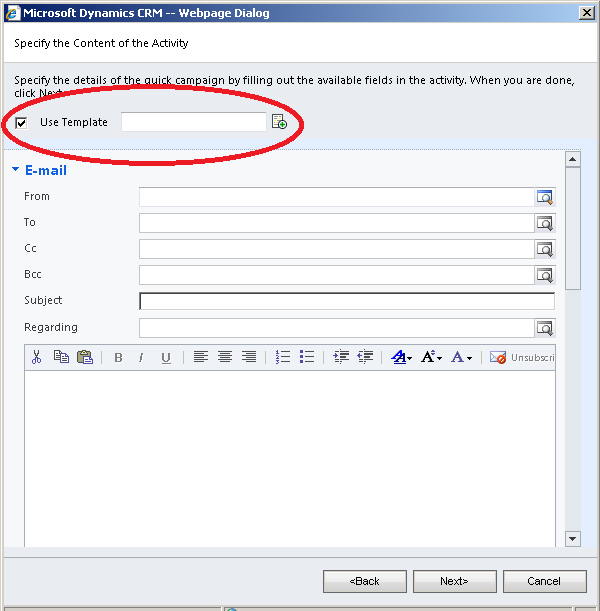 The email form shown during Campaign Activity distribution also has this ‘Use Template’ option for selecting email templates and thus enables sending Bulk email with attachments. 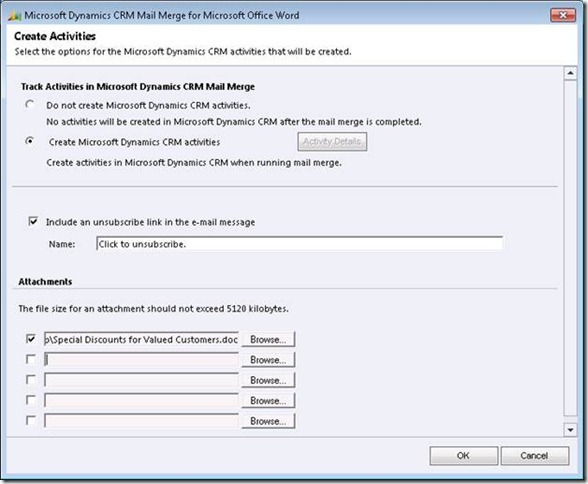 Another way to send Bulk emails in Microsoft Dynamics CRM is by using Mail merge. Sending email via Mail merge is possible on a set of customers selected from the grid, or for a Marketing list or as a mode of distribution of Campaign Activity and Quick Campaign. To add attachments while sending emails through mail merge, complete the Word mail merge process and choose to send the ‘Electronic mail’ in the Word doc. In the final dialog where you select to create your emails in CRM you will find a new section added which allows you to select attachments for emails. Here you can browse and add up to five attachments. The mails that will be sent out by mail merge will have these attachments added to them and so will be the email activities that are created in CRM. CRM Administrators may be anxious to know how these attachments to bulk email are saved and will the multiple copies of same attachment flood their databases. Here is the good news for them – the design of this feature ensures that only a single copy of attachment used in bulk email is saved and all email records in CRM refer to the same copy of the attachments. If bulk email were created using an email template then the template also shares the same copy of attachment. Deleting a single email from amongst the bulk email does not delete the attachment physically and other emails continue referring to it. The attachment is deleted only when last email or template referring to that attachment is deleted.